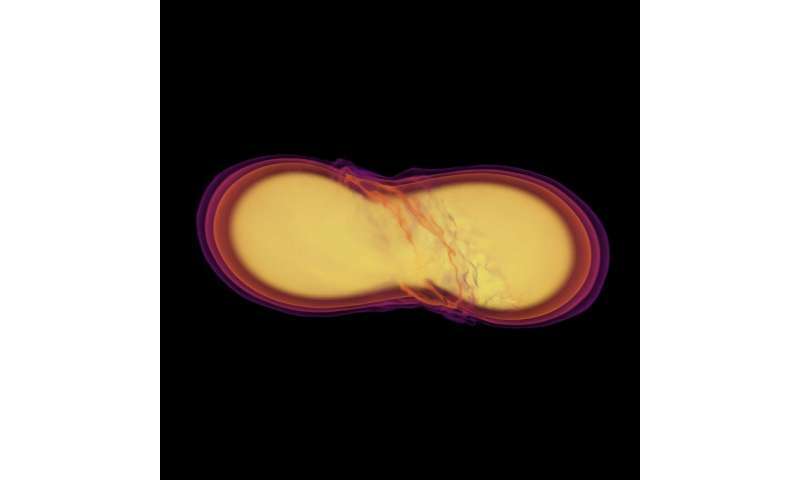 This snapshot of the first milliseconds in the violent merger of two neutron stars, calculated and rendered by associate research scholar David Radice and collaborators, reveals the stars’ gravitational tidal effects on each other. In the next 10 milliseconds, they will merge into one rapidly rotating massive neutron star, then collapse into a black hole surrounded by a transient disk of material. This artist’s impression video shows how two tiny but very dense neutron stars merge and explode as a kilonova. Such a very rare event is expected to produce both gravitational waves and a short gamma-ray burst, both of which were observed on 17 August 2017 by LIGO–Virgo and Fermi/INTEGRAL respectively. Subsequent detailed observations with the NASA/ESA Hubble Space Telescope and other telescopes all over the world have confirmed that this object, seen in the galaxy NGC 4993 about 130 million light-years from the Earth, is indeed a kilonova. These objects are the main source of very heavy chemical elements, such as gold and platinum, in the Universe.